Our patients spend most of their lives far away from an examination room. If we are truly going to capture our patients’ attention and engage them in their care, then we must reach beyond the four walls of the clinic, hospital, or endoscopy suite. This is the vision of the digital health movement—an effort to monitor patients remotely and dynamically with mobile health (“mHealth”) smartphone applications, electronic health record portals, social media, and wearable biosensors to improve health care outside of the clinical trenches. This article explores how advances in digital health may improve health-care delivery, focusing on gastroenterology and hepatology. It describes how technology can monitor patients remotely, improve face-to-face care, drive clinical decisions, and offer value to health-care organizations, their patients, and their staff. The article also describes pitfalls and shortcomings of digital technologies and concludes by describing a new model for how digital health can be deployed at scale to improve coordination and outcomes of care. Take a look at the picture in Figure 1. This is where we deliver most of the health care in the United States and around the modern world. If you think about it, you will realize that this room is unusual. There is no other room in our lives that bears any resemblance to this room. It has a strange looking table–chair lined with tissue paper, bland walls, and a sink. It is impersonal and sterile. People do not want to come to this room. Most of our patients spend 99.9% of their lives far away from an examination room. People spend time at work, at home, in parks, at senior centers, and just about anywhere else but with us. Going to the doctor—whether to see a gastroenterologist or anyone else—is like going to the Department of Motor Vehicles. That is, you know you will get something out of it, but you will first sit in an impersonal waiting area while the rest of the world goes about its business; it can be awkward, sometimes inhospitable, and always comes with an opportunity cost. 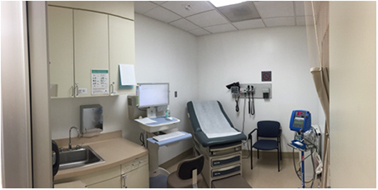 If we are truly going to capture our patients’ attention and engage them in their care, then we must reach beyond the four walls of the clinic, hospital, or endoscopy suite. We have to reach out to where our patients live, work, and play. We have to think outside of the (literal) box. This is the vision of the digital health movement—an effort to monitor patients remotely and dynamically with mobile health (“mHealth”) smartphone applications, electronic health record (EHR) portals, social media, and wearable biosensors to improve health care outside of the clinical trenches (1). You will notice something else familiar about the picture that, as of yet, does not cleanly align with this optimistic vision of digital health. Right in the middle of the picture, emotionally and physically separating us from our patients, is the oft-maligned EHR. The EHR was originally designed to serve the transactional needs of administrators and billers, less so to support the therapeutic bond between patients and their health-care providers. Yet, for most doctors, the EHR is the only consistent evidence of a digital health revolution. The Affordable Care Act (ACA) included $30 billion to support health information technologies—principally the EHR—and the result is a computer in nearly every examination room in America. Nonetheless, the EHR can undermine the therapeutic bond, reduce provider satisfaction, and increase documentation requirements (2, 3, 4). If we are going to enhance patient care, then we must also coax the EHR to do our bidding; it needs to benefit our patients and providers, not undermine the joy of medicine. Digital health innovators still have lots of work to do. This article explores how advances in digital health may improve health-care delivery, focusing on gastroenterology and hepatology. It describes how technology can monitor patients remotely, improve face-to-face care, drive clinical decisions, and offer value to health-care organizations, their patients, and their staff. The article also describes some pitfalls and shortcomings of digital technologies and offers caveats for clinicians and their patients determining how to engage in digital health. The article begins with a framework for how digital health allows clinicians to reach beyond the four walls to monitor patients. It then reviews major digital health technologies and provides examples of how they are being used in gastroenterology and hepatology to improve care, with a focus on evidence-based examples supported by peer-reviewed literature. The article concludes by describing a new model for how digital health can be deployed at scale to improve coordination and outcomes of care. A “2 × 2” Framework for Digital Health Digital health is ultimately about our patients; it is about monitoring and improving their physical, social, and emotional health. With that mindset, we can imagine a “2 × 2” table of opportunities to evaluate patients using digital technologies (Figure 2): patient outcomes can be subjective or objective; they can be measured actively or passively. This framework yields four opportunities for digital monitoring. The top row of the 2 × 2 framework includes subjective outcomes of health. In the left upper corner, defined by subjective outcomes that are actively assessed, is the world of patient-reported outcomes (PROs). PROs are subjective experiences of health that are reported by our patients using formal questionnaires; they include symptoms, health-related quality of life, functional status, and satisfaction (5). PROs are used like vital signs to assess the quality of health-care delivery. Previously relegated to traditional “paper-and-pencil” assessments, PROs are now measured efficiently with smartphone apps and EHR portals (5). In order for health-care providers to collect PROs, they must actively prompt patients by offering apps and portals and then by sending timely reminders. The right upper quadrant, defined by subjective outcomes that are passively assessed, contains the world of social media. With applications such as Facebook, Twitter, Google +, and YouTube, among many others, patients are dynamically sharing information about virtually every aspect of their lives. There is no intervention required by health-care providers, no outside prompting, and no provision of PRO questionnaires. Instead, analysts can just listen passively as global forums self-assemble to collectively share knowledge, attitudes, beliefs, and experiences about their health and wellness. Beyond subjective data, objective biomarkers remain central to the everyday management of digestive and liver health. Until recently, it has been difficult to monitor physiological biomarkers remotely. 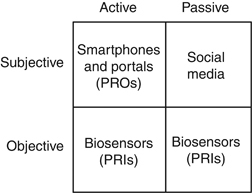 However, advances in microcomputing enabled development of wearable biosensors that measure a range of parameters. Off-the-shelf devices such as Fitbit, Jawbone Up, Withings, and the Apple Watch, among many others, allow convenient acquisition of free-range data. This “connected health” revolution is rapidly changing how we can measure patients unobtrusively and in real time. Patients can actively trigger a biosensor when experiencing a health event or symptom (bottom left corner) or just wear a biosensor to passively monitor background activity (bottom right corner). Data from biosensors may lend context to other clinical data, such as laboratory tests, imaging studies, or endoscopic findings. For purposes of this article, data captured from wearable biosensors will be called patient-reported informatics, or PRIs, to contrast with PROs. EHR portals and smartphone apps allow patients to transmit data to providers, track their own data, receive education, connect with other patients, schedule appointments, refill prescriptions, and access test results (6). EHR portals, such as the Epic MyChart or Athenahealth Communicator, offer bidirectional access between patients and clinicians through the health record. Third-party mHealth apps, of which there are now >165,000 available (7), may allow patients to connect with their doctor or may be a stand-alone program without connectivity to a health system. Because it is still technically challenging to connect third-party apps to many commercial EHR systems, most apps are not yet seamlessly integrated with the EHR. However, this should change soon as “meaningful use” legislation makes it easier for patients to access their own EHR data via apps. Also, most EHR vendors are developing technical solutions to connect with third-party offerings. Treating the EHR like an “app store” has potential to transform it from a mere data repository to a dynamic, service-oriented platform. Yet, despite the promise of EHR portals and apps, there are relatively few digital solutions that assist clinicians in diagnosing, educating, managing, and ultimately enabling patients. As an example of a clinically useful app supported by published data, Bajaj and colleagues developed Encephalapp—a smartphone-based test for hepatic encephalopathy (Figure 3) (8, 9). In a set of elegant studies, the investigators found that Encephalapp can diagnose encephalopathy with a high degree of accuracy when compared with the specialized Stroop test (8, 9). This is an example of an app that fills an unmet clinical need by efficiently and accurately diagnosing a critical condition at the point of care or even remotely. As another example of an app supported by published data, our research team developed and tested an online system called MyGiHealth (10, 11). A patient connects to the system on their computer, tablet, or smartphone. Next, they report their symptom history from home, in the waiting room, or from any other connected location. 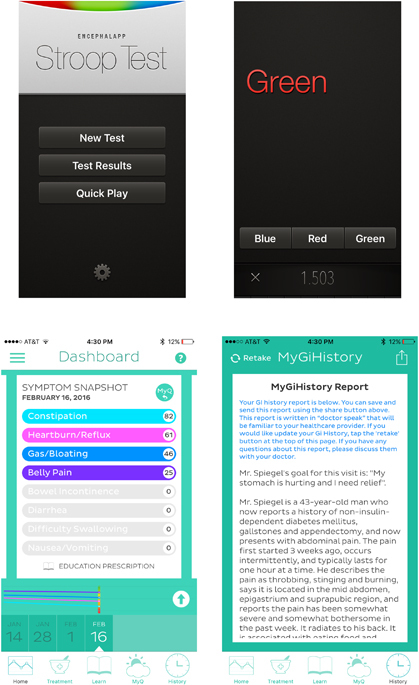 The app collects information using a computer algorithm that guides patients through a library of questions measuring the timing, severity, frequency, location, quality, and character of their gastrointestinal (GI) symptoms, along with relevant comorbidities, family history, and alarm features. The app then “translates” the report into a narrative history of presenting illness (HPI) written in language familiar to clinicians and made available through a portal. In addition, the app measures symptom severity with validated scales from the NIH Patient Reported Outcomes Measurement Information System (Figure 3) (12). We conducted a head-to-head study comparing the quality of HPIs composed by physicians during usual care vs. HPIs generated by the app (10). Blinded clinical reviewers graded the HPIs using a standardized scale; they did not know that a computer had composed half the HPIs. The computerized HPIs were perceived to be of higher overall quality, better organized, and more succinct, comprehensible, complete, and useful compared with HPIs written by physicians. In addition, a blinded Medicare compliance officer judged that 100% of the computerized HPIs could be billed at the highest level of complexity, compared with 88% of the human histories. In a separate study, the app also identified more alarm features than the physicians, such as weight loss or rectal bleeding (11). These results provide an example of how we might coax more functionality from the EHR by connecting it with an app designed to support the needs of patients and clinicians. Although not yet published in peer-reviewed research, the SmartClinic app is another mobile solution designed to improve the patient experience and help the doctor. Developed by Paul Berggreen, a gastroenterologist in Arizona, SmartClinic can be used to remotely send colonoscopy prep protocols and instructions, appointment reminders, treatment instructions, and satisfaction surveys. The app also provides secure messaging between patients and their providers and allows for compliance tracking and measuring of quality indicators. There are a wide variety of other apps of relevance to gastroenterologists, including symptom tracking apps (e.g., Poop Log, Bowel Mover, GI BodyGuard), bathroom finders for patients (e.g., Sit or Squat, Poop Map, ipee Address), and disease-targeted apps for inflammatory bowel disease (e.g., Gut Check, GI Buddy), irritable bowel syndrome (e.g., Sounds Like IBS, Bowelle), and constipation (e.g., Tummy Trends), among many others. Although many of these apps offer helpful information and positive user experiences, very few are supported by published evidence. This is important because the effectiveness of any biomedical intervention—whether digital or otherwise—should optimally be supported by peer-reviewed research. Social media has forever changed how society communicates. In health care, there are thousands of online forums where patients share information about their illness, discuss how it affects their lives, and exchange notes about how they are managing and treating their symptoms. With more mobile phones in the world than toothbrushes (13), trillions of text messages per year, and over a billion Facebook users, this is a permanent change. Researchers are now harnessing the power of social media to understand the illness experience of our patients. Although social media is a new data source for health care, it presents a rich opportunity to learn about the lives of non-experimental patients outside the walls of health-care facilities. In addition, people of all education levels and ages, from adolescence to late adulthood, use social media. This allows for a sampling of perspectives over a wide geographic distribution. Social media is currently being used for patient recruitment for clinical trials (14), measurement of consumer sentiment (15), patient education (15), formation of patient affinity groups (14), patient monitoring, management of patient care, and epidemiological research (15, 16). Sentiment analysis and “digital ethnography” of social media data have been used to identify diurnal and seasonal mood variations across cultures (17), monitor viral epidemics (18), describe the spectrum of migraine headache symptoms (19), and predict which postpartum mothers will develop depression (20). Social media can also be used to passively monitor patients with GI disorders. For example, we performed digital ethnography to identify patients with inflammatory bowel disease and learn about their illness experience. Working with computer scientists, we identified patients with Crohn’s disease by trolling through the world’s tweets (21). We then developed a natural language processing algorithm to automatically identify patients without requiring hand-review of tweets; this allows analysts to track individual patients over time. Whereas the confines of an office visit may inhibit some patients from expressing their true opinions, they often voice free-flowing, detailed, and open information when outside of a health-care facility. For example, we recently used social media to study how patients using opioids balance GI side effects, such as opioid-induced constipation and nausea, with pain management (22). Computers parsed through 2,519,868 Tweets and >1.8 billion e-forum posts to eventually identify 3,003 individuals who experienced opioid-induced GI side effects. The resulting posts revealed a struggle to balance pain management with GI side effects. Often, patients expressed frustration that their prescribing physicians failed to warn them about GI side effects, and many altered their pain medication regimens without consulting their physician. This example reveals how social media can passively tap into the lives of patients outside the four walls of the clinic and can identify opportunities to improve physician–patient communication. Ubiquitous broadband networks and penetration of smartphones across socioeconomic strata have spurred a technical revolution in remote patient monitoring. In addition to collecting PROs from smartphones, it is now possible to supplement PROs with PRIs, such as step counts, stairs climbed, caloric expenditures from exercise, heart rate, and sleep parameters found on commonly available biosensors. In addition to consumer biosensors, there are Food and Drug Administration (FDA)-approved, medical-grade sensors that monitor a range of physiological data, from heart rhythms (23) to medication adherence (24) to GI motility (25, 26). In theory, remote monitoring of PRIs can potentially “fill in the blanks” by building a more complete and accurate picture of disease progression in the real-world environment. This capability is part of modern “population health,” as defined in the post-ACA era. In particular, if remote digital monitoring can identify subtle but meaningful clinical changes that predict expensive outcomes across large patient groups, then it might improve population health management on a large scale. Despite the hype and promise of using digital monitoring for patient care, many of its purported benefits have not yet been rigorously tested at scale. There is a pressing need for more research supporting population health monitoring with digital devices. It remains unclear whether PRIs from wearable biosensors meaningfully correlate with clinical outcomes, how they should be collected at scale for population health management, and how to interpret the results in the context of other outcome measures, such as PROs or laboratory markers. For these reasons, the NIH is now examining the role of wearable biosensors as part of the national Precision Medicine Initiative. Our research team at Cedars-Sinai is also studying the role of wearable biosensors in patients with conditions across specialties. By remotely measuring PROs and PRIs at the same time while patients receive treatment, we can correlate biosensor data with patient symptoms and outcomes. For an example outside of gastroenterology of how PRIs may be deceiving, consider Figure 4, which shows the results of remotely monitoring pain scores (a PRO) against step counts (a PRI) in a 72-year-old woman with rheumatoid arthritis receiving biological therapy. Prior to the study, the patient explained that she refuses to let her disease stop her from her daily activities but regrets how it keeps her from her true passion: writing. She found relief during the treatment course of the study, and her pain, fatigue, and joint stiffness all improved dramatically over the course of 30 days. Yet, Figure 4 reveals an unexpected disconnect between the PRO and PRI data. There is a steady symptom improvement in the left panel, yet the subject moved less and less during the treatment period, shown in the right panel. This counterintuitive pattern became clear only after speaking with the patient: the symptom improvement allowed her to return to her work, writing. Stiffness and pain in her knees and ankles had previously prevented her from sitting at her computer for long periods of time, a necessary prerequisite for the type of work she was passionate about. As her symptoms lessened, sitting at her desk for many hours and registering little movement beyond typing was an “activity” she could return to with gusto. Diminished pain and stiffness in her knees and ankles allowed her to be less physically active and to achieve a greater quality of life in the process. Only by contextualizing the patient’s PRO and biosensor data with a face-to-face interview did the data streams give a clear picture of her progress and its effects on her quality of life. Had we been monitoring this patient from a remote digital coordination facility, tracking her steps as a surrogate measure of illness severity, we would have been misled. Instead, her inactivity was evidence of her improvement. Our assumptions were violated, showing that we must be careful about overinterpreting wearable biosensor data and always maintain a human-to-human exchange. Nonetheless, published reports show that wearable biosensors, when used in the right setting, can be highly accurate in monitoring patients. Medical-grade biosensors are validated to remotely monitor blood glucose, survey for falls, assess dementia, identify arrhythmias, track vital signs, predict asthma exacerbations, and measure levels of physical and emotional stress, among other applications. In gastroenterology and hepatology, however, there are very few examples, to date, of applying wearable biosensors. This is expected to change soon; investigators are beginning to collect PRIs in patients with chronic digestive diseases, such as inflammatory bowel disease or irritable bowel syndrome. In the absence of validated wearable biosensors designed for patients with GI disorders, our research team developed, tested, and obtained regulatory approval for a device called AbStats (25, 26). Cleared by the FDA in December 2015, AbStats is a biosensor that non-invasively measures intestinal activity—similar to a “gut speedometer.” The sensor is disposable, about the size of a large coin, adheres to the external abdominal wall, and has a small microphone inside that monitors intestinal sounds. A specialized computer analyzes the results and presents a value called the “intestinal rate,” measured in acoustic events per minute. If the intestinal rate is very high, like 30 or 40 events per minute, then it indicates the gut is revved up and active. If it is very low, like 1 or 2 per minute, then it indicates the intestines are dormant or, possibly, even dysfunctional depending on the clinical scenario. Research shows that AbStats can predict which postoperative patients will develop ileus; this can help make evidence-based feeding decisions based on dynamic changes in postoperative intestinal rate. We are also evaluating the role of AbStats to track gastric-emptying time non-invasively, monitor outcomes in other functional GI and motility disorders, track food intake, and distinguish ileus from bowel obstructions, among other applications. Integrating digital technologies into a harmonized health delivery model may improve process and outcomes of care. If used effectively, digital health monitoring may tailor care to individual patients, extend clinicians’ reach outside of the hospital and clinic, improve timeliness and specificity of care, deliver proactive (not reactive) care, and better engage patients in their health. Still, there are looming questions we need to answer: Who will be checking all of the data? How can doctors, who are busy in the clinical trenches, be responsible for monitoring and acting upon the data streaming off wearable sensors, social media, apps, and portals? Will clinicians get paid for all this extra work? Who has time for this? The answers are simple: No doctor can sit around checking this data. Clinicians are too busy for this work. Plus, there is potential liability if a clinician misses key data and fails to act. Finally, doctors do not, as of now, get paid for any of this work. In short, digital health may sound terrific, but current structural realities make this vision untenable. How do we move forward with digital health? I believe the answer lies in training a new type of specialist called the “Digitalist.” The Digitalist does not yet exist, just as “The Hospitalist” did not exist prior to 1996, when Robert Wachter and Lee Goldman (27) coined the term to describe a much-needed clinician to fill an unmet need for inpatient care. Now we have an unmet need for a new clinician, trained in digital health, who will monitor, interpret, and act upon remote patient data. The Digitalist will reside in a digital coordination facility and remotely track data from biosensors, portals, apps, and social media and then combine the data with clinical parameters and knowledge about the patients’ medical history. The Digitalist will bear responsibility for monitoring and acting on the data and will also be paid for the work in return for improving value and efficiency of care delivery, intercepting crises before they unfold, reducing avoidable admissions, and coordinating care with traditional providers in the clinic. Figure 5 depicts this evolving model of health-care delivery. Patients will transmit actively and passively collected data through apps and portals. The Digitalist will monitor the data, and, if needed, contact the patient via EHR portal, telephone, or videoconferencing. If appropriate, the Digitalist will communicate directly with clinicians, inform them of updates, and coordinate the optimal timing of in-person visits. The clinician may also access digital health reports, review the results with the patient, and make further decisions based on the data coupled with the traditional history and physical examination. Model of digitally enhanced health-care delivery. 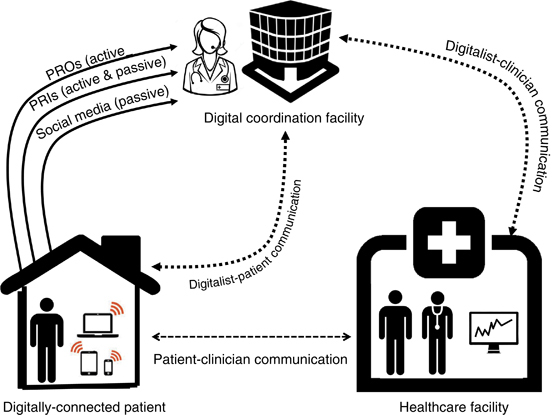 In addition to traditional patient–provider communication and coordination, digital health affords new opportunities for remote monitoring of data, including patient-reported outcomes (PROs) actively reported through apps and portals, patient-reported informatics (PRIs) actively and passively collected by wearable biosensors and transmitted via wireless networks, and passive monitoring of social media data. The “Digitalist,” residing in a coordination facility, monitors the data streams and directly communicates with patients via portals, telephone, or videoconferencing and then coordinates directly with clinicians as needed to manage patients. If successful, digital health will expand care beyond the traditional clinic visit, use visits more effectively, reduce avoidable admissions, and improve outcomes of care. Time will tell if this future becomes reality, but for many health systems, the future has already arrived. Now is the time for gastroenterologists and hepatologists to shape the future of digital health for our field before others shape it for us. Guarantor of the Article: Brennan Spiegel, MD, MSHS. Specific author contributions: Brennan Spiegel wrote the article. Potential competing interests: The author discloses the following: Allergan (advisor); Amgen (research grant); Astra-Zeneca (research grant); Commonwealth Laboratories (advisor); GI Logic (patent & royalty rights for AbStats); Ironwood Pharmaceuticals (advisor; research grant); Millennium Pharmaceuticals (advisor); My Total Health (co-founder, patent, and royalty rights for MyGiHealth); Nestle Health Sciences (research grant); Takeda Pharmaceuticals (research grant); and Valeant Pharmaceuticals (advisor). Topol E. The Creative Destruction of Medicine: How Digital Health Revolution will Create Better Healthcare. Basic Books: New York, NY, USA. 2012. IMS Institute, Patient Adoption of mHealth, 2015. https://www.imshealth.com/en/thought-leadership/ims-institute/reports/patient-adoption-of-mhealth. Allampati S, Duarte-Rojo A, Thacker LR et al. Diagnosis of minimal hepatic encephalopathy using Stroop EncephalApp: a multicenter US-based, norm-based study. Am J Gastroenterol 2015. Nicole H Mobile Marketing. More Mobile Phone Access than Toothbrushes, says Google 2012; http://60secondmarketer.com/blog/2011/10/18/more-mobile-phones-than-toothbrushes/. De Choudhury M, Counts S, Horvitz E. Predicting postpartum changes in emotion and behavior via social media. ACM Annual Conference on Human Factors in Computing Systems, Paris, France, 27 April-2 May. 2013, 3267–3276. Strom D, Sheen V, Arnold C et al. Measuring Health Related Quality of Life (HRQoL) in Crohn's disease using Twitter: a pilot study of social media as a novel tool to assess disease burden. Gastroenterology 2013;4 (Supplement 1): Page S-378.